'Tis the season for spices like cinnamon, nutmeg, and ginger. Spices give warmth and flavor to our homes and our favorite foods this time of year, but for individuals with spice allergies, they can pose the same risk as the foods most commonly associated with allergies. Reactions can range from sneezing to life-threatening anaphylaxis, and can be triggered by spices used in food, drinks, cosmetics, toothpaste, air fresheners, and other products found around the home. People who are allergic to spices can develop symptoms as a result of eating, inhaling, or touching them. Allergies to spices -- fresh or dried, ground, toasted, or otherwise processed -- are rare (affecting 2 to 3 percent of individuals worldwide), but are also thought to be under diagnosed because of the lack of reliable tests for them. This allergy is also difficult to identify, since spices are not regulated by the Food and Drug Administration and are not always listed on food labels, making it difficult to determine which foods to avoid. Common spice allergies are to cinnamon, garlic, black pepper, and vanilla. 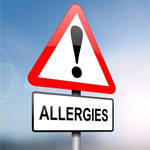 Sami Bahna, MD, past president of the American College of Allergy, Asthma & Immunology, recently noted that a spice allergy should be suspected when an individual has multiple reactions to unrelated foods or when reactions occur to commercially prepared foods, but not to the same foods cooked at home. Because there are no skin or blood tests for many spices, it's important to record as many details as possible if you're experiencing symptoms. Try to keep a record of which foods trigger symptoms. If you're having a reaction to a food you ate at a restaurant, most chefs are happy to share their ingredients list to help figure out the trigger and keep customers safe. Just remember, a runny nose in response to a spicy dish or sneezing after inhaling black pepper are perfectly normal reactions, but hives, swelling, and wheezing can indicate an allergy. Dr. Bahna recommends consulting an allergist to help identify the allergen and come up with a plan for coping with the allergy.